Wow, this is one great Rizzo Grease Costume. We have plenty of 1950’s Fashions, like 50’s Wiggle Dresses that are perfect for the Classic Rizzo Grease Costume. There are all of the 50’s Genre ‘Grease’ Movie Characters Outfits in stock and any other 50’s Era Movies, 50’s Genre TV Shows, 50’s Historical Characters, 50’s Hollywood Celebrities and 50’s Broadway Musicals or High School Theatrical and School Project Costumes. We have 1950’s Vintage Clothing, 50’s Retro Fashions, Pinup Enthusiast Outfits, 50’s Formal & Casual Dresses, 50’s Pinup Pumps & Shoes and every 1950’s Era Hairdo Wigs you can imagine. Get the 50’s Glasses, Sunglasses, Clutch Purses, 50’s Jewelry and all of the other accessories you need to complete the 1950’s Amazing Outfits you want. 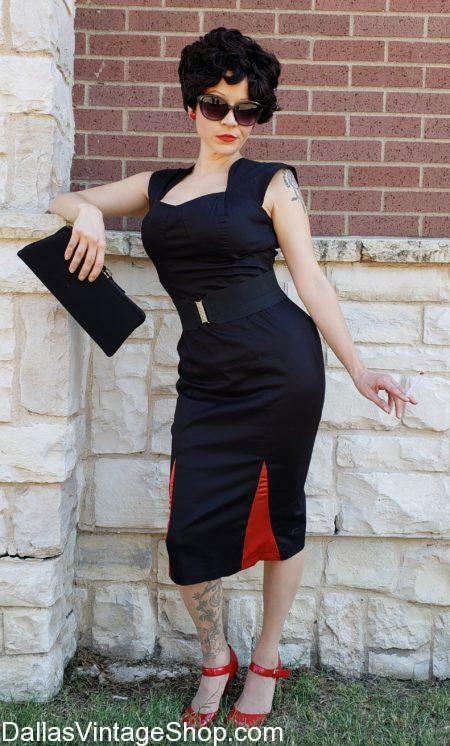 Dallas Vintage Shop has the Largest & Most Extensive Collection of 1950’s Costumes & Accessories in the Metroplex and we are open year round to serve you.